I'm brand new to eG and was lured here after seeing a link to this thread on another discussion board. I have no idea what I was looking for at the time... that was hours and hours ago. I've been so caught up in reading here! My name is Susanne and I'm an American living for the last 3 and a half years in the Netherlands. I moved here to live with my Dutch boyfriend. It's been great for the most part and I love it here (I must to voluntarily live where it gets dark at 4 in the afternoon this time of year!). I totally took over the boyfriend's kitchen after I moved and have been having a super time adapting my American recipes for Dutch ingredients and learning new ones from him. I'm by no means an expert at Dutch dishes, though I make them almost as often as my comfort foods from back home, but when people started asking how to pronounce Klary's recpes I thought I might be able to help. Hey, 2 years of Dutch lessons have to be of some use, huh? I've also taken the liberty of adding a few comments about the Dutch foods from a North American's point of view. Hope folks find it useful and/or interesting. Flour - Dutch wheat flour is made with "hard" wheat and has a higher gluten content than that in North America. This makes for super bread but often terrible pastries and especially cakes. My observation has been that there are not many fluffy Dutch baked goods. They tend to be more heavy treats such as the boterkoek. I've made some quick breads with Dutch ingredients (using the same recipes I used in the US) that turned out more like construction material than a consumable. My solution for using Dutch flour in American recipes has been to sift, sift, and sift again and then mix as little as possible. To adapt a Dutch recpe to North American ingredients I would suggest to use a little extra flour and to mix it very well. The 'e' at the end of a word is pronounced as an English short 'e' as in tent but a soft sound, so I used 'eh' below. The stressed syllable(s) are in capital letters. Speculaas (spek-you-LASS) - Any of a number of cookie/cake confections made with a combo of cinnamon, cloves, cardamom, ginger, nutmeg, and white pepper. Klary adds coriander and aniseed. These aren't listed on the jar of Speculaas spice mix I have but sound great also. Pepernoten/kruidnoten (PAper-note-en/KRAUT-note-en) - technically 2 different cookies but usually both mean a dime-sized crispy spice cookie, seasoned similarly to the speculaas and found absolutely everywhere during November and December. Stroopwafels (STROPE-vah-fels) - crisp, thin waffle cookies with a layer of butter caramel in the middle. My personal favorite that I would be forced to import if I ever moved back to the U.S.! Friese Dumkes (FRESE-eh DUM-kehs)- Aniseed hazelnut cookies. 'Dum' is apparently Friesian for 'thumb'. 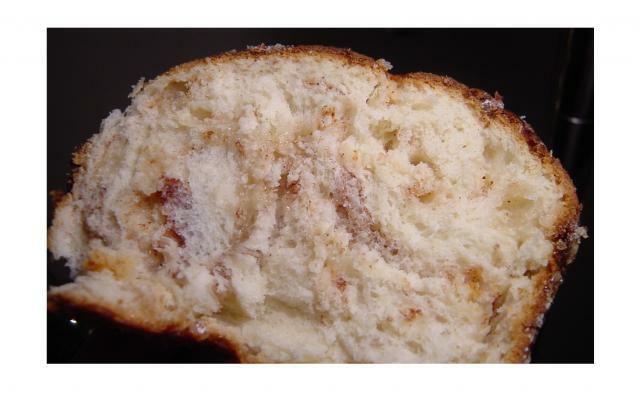 Olliebollen (OH-lee-ball-en) - Fried sweet-bread balls, usually with currants or apple bits in the dough. A New Year's Eve tradition. Appelstroop (APple-strope) - Very thick apple syrup. Tart and not very sweet. To me it has a taste like apple butter and molasses mixed, though the texture is syrupy like molasses. Draadjesvlees (DRAD-yehs-flase) - lit. 'stringy meat. Terrible translation for so tasty a dish. Erwtensoep/Snert (ERT-en-soup/snert) - Dutch pea soup. Erwten (green pea) is actually a killer to pronounce, so I always just use the name Snert, though technically that means day-old ertwensoep. I never liked pea soup till I tried the Dutch type. It really is different! Stamppot (STAMP-pot) - lit. Stamp, stomp or mash. Any one-dish vegetable/mashed potato combination. See below for specific types. Dutch potatoes are very crumbly and mashed potatoes are made with just a little bit of milk and butter added to the cooked potatoes then mashed with a wire potato masher. Hete bliksem (HATE-eh BLICK-sum) - Mashed potato/apple mix. Called 'Hot Lightning' because the cooked apples hold their heat for quite a long time. Delish! Borenkool stamppot (BOOR-en-kole STAMP-pot) - Mashed potato/curley kale mix. Kroket (pl.Kroketten) (kro-KET/kro-KET-ten) - Mushy meat and seasoning sometimes veggie mix in a crumb breading, deep fried. Usual shape is a finger-long cylinder. Center remains mushy after cooking. Bitterballen (BIT-ter BALL-en) - bite-sized versions of bitterballen. Kroketten kruiden (kro-KET-ten CROWD-en)- pepper, salt, mace, nutmeg and thyme. Boerenmeisjes (BORE-en MICE-yuhs) - lit. Farmer's girls. Spiced apricot in liquor. Boerenjongens (BORE-en YOUNG-ens) - lit. Farmer's boys. Spiced raisins in liquor. Advocaat (Ahd-fo-COT) - Alchoholic Dutch eggnog. Vla (flah) - Pourable Dutch pudding, sold in stores in cardboard milk cartons. Bitterkoekjes (BIT-ter KOOK-yuhs) - A small, chewy, not-too-sweet cookie made of almonds and peach pits. A little odd but yummy. Kapucijners (cap-oo-SINE-ers) - Dutch Blue Pea in the US. Sort of like chickpeas. Appeltaart (AP-ple tart) - The real, original Dutch Apple Pie. I love it with sweetened dried cranberries instead of the raisins or citrus thingies. I think the Netherlands is a great place for an American to settle in. The culture there has so much to offer and the people are so nice, I think anyone would be fortunate to live there. My time was spent up in Enschede near the German border in the North part of the country. Fresh, soft white bread, butter, cookies. This may seem weird but the combination of the squishy bread, the sweet butter and the crunhcy spicy cookies is just fantastic... I think I was maybe 12 the last time I had this... Now I wonder what took me so long! Oh Yum, my Oma used to make these for me. 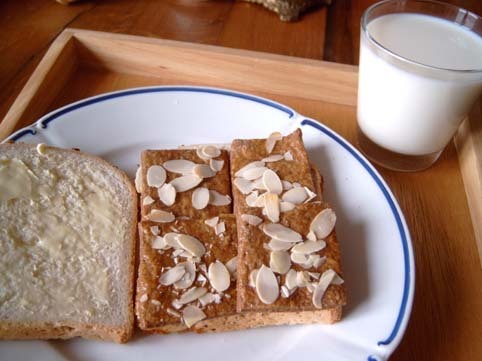 I made some speculaas with your recipe (I already had the kruiden) and just had to have a sandwich with the bread I had just made also. It tasted so good I had to stop and ring my Oma just to tell her. 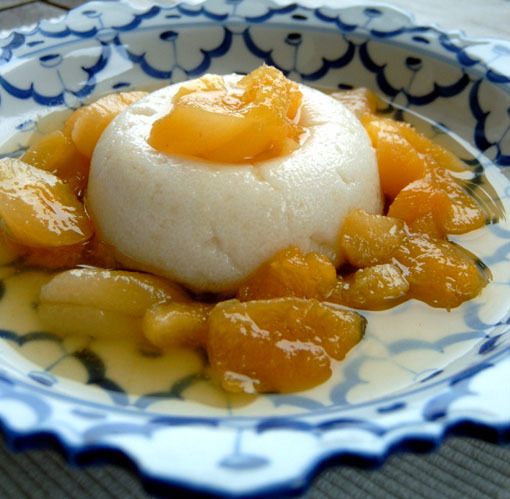 Chufi, I have just joined eGullet thanks to your wonderful recipes and would like to wish you well. I would also like to add that in your Apple Pie ingredients in Recipe Gullet you have missed out the egg in the dough and did not mention the size of the tin. Edited to add that Mum just checked her old Dutch cookbook and her recipe doesn't contain egg in the dough anyway. Thank you for the fantastic food along with the mouth watering photos. Welcome to eGullet, Suzanne and Cadbury. That's an awesome pronunciation guide, Suzanne! I get it entirely, including the G, but now I'm wondering whether the S and the R have some special pronunciation features. I expect that they have a Germanic sound, but that's just guessing. Hopefully Klary will be back soon to tell us she's well on the road to recovery. I'm going to make some advocaat this week, and drink a bit in her honor. Thank you for the great first post, Susanne! Bless your heart for taking the time to write out that pronunciation guide. Those examples are a great starting point for the rest of us. I can now take a decent stab at pronouncing Dutch words. Klary, I hope you are doing well and recovering nicely. Klary, you've been in my thoughts this week! So has your sukerbole, which I made this afternoon. It's delicious! My oven may have been a bit too hot (I really need to get an oven thermometer, because I think the dial is just off), but it came out well, if a bit dark on top! And, man, is it tasty! Thank you so much for this recipe...I can't wait to make it for my family for breakfast on Christmas morning. Looks terrific! What kind of sugar did you use, and where did you find it?? And thank you Susanne for the wonderful guide - that must have taken you forever!! I am here, not completely my old self, but well enough to browse EGullet and find all these wonderful new posts.. I'll try and answer them one at a time.. But first of all, a thank you from the bottom of my heart to everyone who wished me well, either on the thread or through PM's.. it really meant a lot to me. You are wonderful people! Megan that looks so good.. Like Danielle, I would love to know what type of sugar you used.. The marbled cinnamon effect is lovely.. Any Frisian baker would be proud of you! Hi Susanne and welcome to EGullet.. That really is a wonderful pronunciation guide you compiled.. thank you so much for doing it, I just did not know how to do it!! I hope you will revisit this thread because I think your comments on ingredients etc. are very heplful to people outside the Netherlands, because you have the other frame of reference as well, which makes it so much easier to explain things. I would love to know on what discussion board is there a link to this thread? 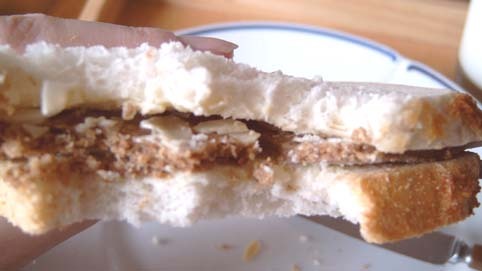 Hi Cadbury and welcome.. the thought of someone in Australia having a speculaas sandwich really made me smile..
WOW! How great to see you back! I hope you soon return to your old self. Don't stress out on the board though! Get well first. Glad to see you back! Take care, hope somebody else is doing the cooking! I'm so glad to see you're alive and well! Keep your eye on your mailbox. Yay! So glad you're back, Klary! 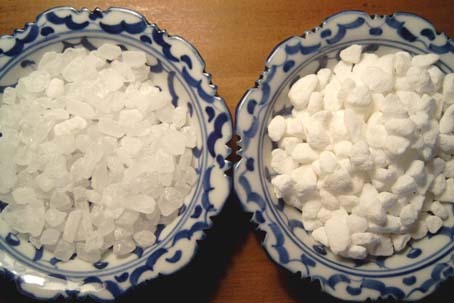 To answer your and Danielle's question, I used some large crystal sugar I bought at a German market near my apartment...I'll post a pic when I get home tonight! It was good, though not as good, I suspect, as clumps of granulated sugar. Maybe not melty enough? Glad to have you back Klary! We missed you so. I hope you are back to normal soon. Edited to try to make sense. How cool is it that this thread has just brought three new people to egullet--two from Australia, and one from The Netherlands! Hope to see more of you guys on this thread and others, including in the Australia and Elsewhere in Europe forum! Welcome back Chufi! Sending warm thoughts to Amsterdam for your continuing recovery. I bake spekulaas koekjes a couple of days ago.....they were so good!! I made my own spices because i wouldn't know where to get de speculaas kruiden in houston. My husband who loves all things chocolate actually loved these koekjes. Thank you for sharing your recipes with us. Glad to see such great comments, especially the translations, although I detect a good American flavour in them, especially the vowels! And isn't it wonderful the variety and great tastes there actually are in Dutch cooking. The food in my family home was never bland. Thanks and "het aller beste voor Kerstmis." Thanks everyone else for the welcomes and the kind words, it did take a while to get that together but it's fun to be able to do the opposite of my norm (adapting American to Dutch recipes). The timing was good, as I'm also off work for a bit due to a wee operation so I had the energy. I actually had a time trying to think of how the sounds are in English, Klary. Some aspects of Dutch are becoming second nature. I do agree that the Netherlands is a super place to visit, especially. It's a bit harder to live here but that's probably the case everywhere. I am very happy with the move. It is quite a shame that the traditional Dutch dishes aren't very available to tourists. Lonja, my American accent comes through even in the writing, huh? LOL @ that! I'm happy to say I've finally reached the point where Dutch people don't instantly switch to English when I speak. A huge step, IMHO! I think it's impossible to get the nuances of the pronounciation but it should be close enough to allow folks to show off a little when they tell friends what their new international dish is called. Sid Post, I live not too far from Enchede, in Apeldoorn. Klary, as nice as Amsterdam is, I'm glad I live in a smaller town. There are sooooo many people in A'Dam! Abra, you're correct that the R is different (it's rolled like a single R in Spanish) but unlike German, the S is pretty much the same as in English. Oh, one other thing I forgot to mention is that the CH is pronounced just like the Dutch clearing-the-throat G sound. Not sure if any of the words above had that in them. Hi Susanne! Did you come here via expatica (I'm mei) ? Thanks so much for translating for us. I leave for Holland in exactly 2 weeks (I'll be living in a small town too) and I'm incredibly excited!! On the right is the 'parel kandij' that I used for the Sukerbole. It is much softer and melts in your mouth (or into the sugarbread). 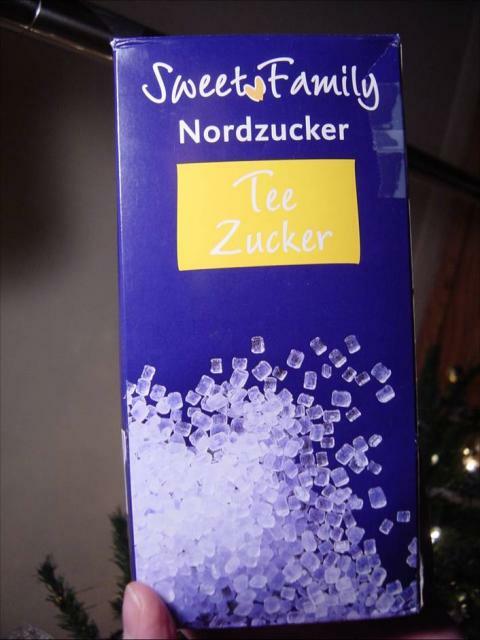 This seems to be ordinary sugar pressed together into lumps. So, I think that maybe if you can't find the soft sugar, you should try the crushed sugarcube trick instead. Did those crystals melt into the bread or stay hard? Some melted, some stayed whole, but those became sort of...crunchy. It was cool, actually. I was worried I would have to avoid them when I saw they hadn't all melted, but their texture had changed, and they crunched between my teeth. Today I made sipelsop, Friese uiensoep, onionsoup from Friesland. 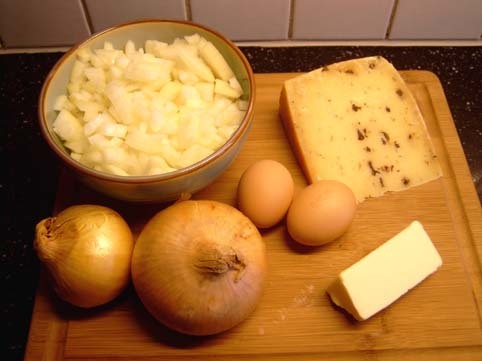 onions, butter, hardboiled eggs, Frisian cumin/clove cheese. Not in the picture: stock, flour, salt & pepper, nutmeg and white wine vinegar. Chopped onions are sweated in butter until soft but not brown. Then a large amount of flour is added, and stock. This is cooked together for 10 minutes until you have a thick, glossy soup. 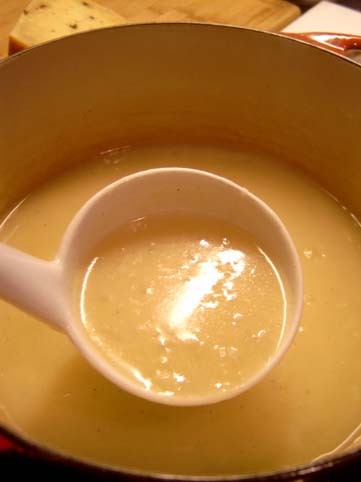 The soup is flavored with a bit of nutmeg, salt and pepper, and a tablespoon of vinegar. It is served with crumbled hardboiled egg and grated Frisian clove/cumin cheese. The funny thing is, that Amsterdam's leading restaurant critic wrote a review of a new restaurant the other week. 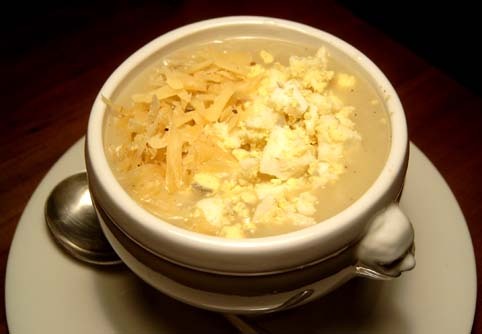 This restaurant serves traditional Dutch dishes and one of the things they have on the menu is this soup. Maybe I should go there and try their version, and maybe they'll prove me wrong! I made it in October: boerenmeisjes, farmers girls, Apricot brandy. After almost 2 months in a cool place it is nicely matured, the fruit has become really soft, and it's ready to use. Today I used it to serve with semolina pudding. To make semolinapudding, heat 1/2 liter of milk. Sprinkle in 50 grams of semolina, and 40 grams of sugar. Boil for about 8 minutes until thick. Pour into 1 large mold or individual ones, cool and refridgerate. Turn out on a plate when ready to serve. Chufi-chka, that looks delicious! So homey.